Coming home is just a little sweeter when home is a farmhouse! 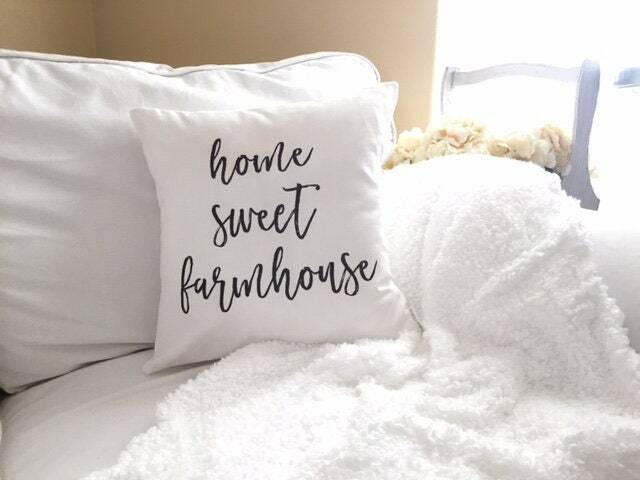 If you're one of the lucky ones, or just wish you were, our Home Sweet Farmhouse pillow cover will set the mood in your space. Limited supply available. Envelope flap closure on back. No zips to break! CARE: Spot clean for small areas of soil. If necessary, hand or machine wash, inside out, with mild detergent, such as Woolite. Air Dry. Do not tumble dry or dry clean. Warm iron if needed, on reverse side or using press cloth over design. PRODUCTION: Please allow 1-2 business days for your pillow cover to ship. Please note: not all orders are eligible for return. Please order carefully! Be the first to know about new products and get access to follower coupons! I accept payment through Direct Checkout on Etsy, Etsy Gift Cards, and PayPal. You can also use your credit card to pay using PayPal even if you don't have a PayPal account. Regardless of your payment method, your purchases on Etsy are always secure. Shop owners NEVER have access to any of your payment information, so you can buy with confidence. If you have further questions regarding payment, you may want to refer to the Etsy payment help page: http://help.etsy.com/app/answers/detail/a_id/339. It is ALWAYS a good idea to double check the size of your pillow forms, even if you think you know what they are. Remember that I will be making a cover to fit your pillows, so accurate measurement is ESSENTIAL and the responsibility of the buyer. I have provided detailed instructions in the "Additional Policies & FAQ" section below, to help you get an accurate measurement. If you need help or have questions, just send me a convo. *All items are in completely new/unused condition - no marks, stains, odors, hairs, etc. If any damage is noted, buyer is responsible for loss in value. NON-REFUNDABLE ITEMS: I'm sorry but I cannot accept the return of any of the following items for a refund. Please order carefully. I will refund the purchase price of your items, once a defect is proven. Contact me within 3 days of receipt of your item(s) to discuss return. I will not issue a refund for items I do not receive back. **Please note: no returns accepted after 10 days from delivery for ANY reason. *Once received, I will ship replacement covers. ITEMS NOT ELIGIBLE FOR EXCHANGE: I'm sorry but I cannot accept the return of any of the following items for an exchange. Please order carefully. **Please note: no exchanges accepted after 10 days from delivery for ANY reason. I want you to enjoy your experience with my store! Please let me know immediately (within 3 days) if your item is defective in any way. Every effort will be made to resolve your concerns. Please note: your transaction is complete once feedback is left. Returns will not be accepted once feedback is left. If you have a problem with your order, please contact me immediately. International customers: All international shipments will be sent via First Class International mail. Please allow AT LEAST 10 business days for your order to arrive. Some shipments may take up to 8 weeks for arrival. However, there may be further delays due to customs, holidays etc. Please understand that I have no control over the speed of your delivery, once your package is shipped. Please note: I am not responsible for, and will not pay, any additional charges due to customs, duties, VAT or taxes. These additional fees are imposed by the destination country and are the buyer's responsibility. All packages will be marked as "merchandise". I will not mark any item as "gift", as this is illegal. **IMPORTANT - Please double check your mailing address during checkout. Please understand that I am not responsible for, and will not pay, additional shipping fees to resend orders returned due to buyer submitted address errors. If you are paying via PayPal, your PayPal and Etsy address MUST match. If not, I will need to cancel the order so you can make those changes and reorder. * All my items are produced by me, in my smoke-free home studio. * Seams on all pillow covers are professionally serged to prevent fraying and to strengthen the item. * All items made from high quality, home decor weight fabrics (unless otherwise noted in listing). Some fabrics, particularly cotton duck, may have color variances or "flecks" which are a natural feature of the fabric. Very rarely, the fabric comes from the manufacturer with a flaw. I inspect my fabrics closely to ensure your item is the highest quality available. * All pillow covers feature an easy envelope closure (unless otherwise noted) with a 5+ inch overlap to prevent gaping. * All pillow covers feature the same fabric front and back (unless otherwise noted). * Pillow Sizing - professionally made pillow covers have a finished size of approximately an inch smaller than the intended pillow form to ensure a nice, snug fit. For example; for a pillow form that is 20" x 20", your finished pillow cover size will be approximately 19" x 19". All listings indicate the intended pillow form size. NOT the finished pillow cover size. All my pillow covers will be made in this manner, unless you request a different finished size when ordering. *Pillow Form Measurement - To measure your pillow forms, take the top two corners of your forms and pinch them between your thumb and forefinger. Then, pull the fabric of the form as taught as possible and hold it up against a measuring tape or yard stick. Alternatively, take a soft measuring tape (or you can use a piece of string, mark it and then measure the string) and drape it over your pillow. You'll want to measure the middle (plumpest part) straight across from one side seam to the other. Either method will give you the size of your form. You'll want to double check that the width and length are the same. Most standard pillow forms will be square, but if you are recovering couch cushions, for example, they can have one dimension that is a little longer than the other. * Pattern placement - all photos in my listings are stock photos. Exact pattern placement will vary on your item (unless specified in listing). If you have a specific pattern placement request, please convo me before ordering.